Dr. P. Manokar is one of the best Cardiologists in Thiruvanmiyur, Chennai. He has had many happy patients in his 19 years of journey as a Cardiologist. 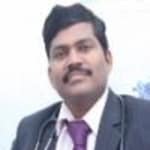 He is a qualified DM - Cardiology, MD - General Medicine, MBBS . He is currently practising at Medall Diagnostics in Thiruvanmiyur, Chennai. Don’t wait in a queue, book an instant appointment online with Dr. P. Manokar on Lybrate.com. Respected doctors, What should one do in emergency 1) if an old man or women aged 45-53 get some severe chest pain and also breathing problem? 2) and also if suddenly get heart attack or something like that or loose consisnous? Which advice for both above situation? Thanks. Sir my dad is having a heart problem .he is having 5 stent in his heart vessels .so what will be the diet for him. Please Home made fresh food containing less spices and oil Avoid oily spicy and fast food, maida containing items like biscuits toast bread khari, non veg food, Give him Salads, vegetable juices, soups regularly. I have BP and doctor advised me to take ivabrad 5 mg along with tazloc 20 tablet. Other doctor told me that ivabrad is not needed. These medicines are advised after several tests and they said treadmill test is also positive. My previous reading were around 165/100 and it came to 130/80 after taking medicine. Do I need to take ivabrad? Please let me know. Lvabrad is not BP medicine, it is given for fast heart beating, sinus tachycardia. You probably don't need Ugandans. Beta blocker medicines are useful for BP and for fast heart beating. You can discuss with your Dr.
My uncle has a severe pain in a artery / vein from approx 5-7 years. The pain starts from the top of the head tll end thumb of leg. And just the right side only. Hand also pains. He has a EAR problem too. Doctor said its problem of neuro some says problem of ENT. He also has high diabetes, sugar and B. P. please HELP. Hi, this is a problem of diabetic neuropathy in which the nerves of body are affected due to uncontrolled blood sugar levels. So advise your uncle to control his dietary habits and monitor his blood sugar levels regularly. Otherwise the problems can increase further. My husband's blood pressure is 140 /85. He is 29 years old. Is this normal? Does he needs to take medicines? At this age and BP range he needs lifestyle changes only and no medicine required. Yoga, meditation, Pranayam; lemon juice drink will settle it. Mere left side chest mai pain or jalan ho raha h jo chest se baju tak or phir hath tak pain ho raha hai kya kare? You might be suffering an APD and need to take omeprazole after consultation with a nearby doctor. Sir, I am 51 years old man taking BP medicine betaloc 25 morning 1 and night 1. Now my regular BP level is 105/65, 110/70. Please advise me. Whether I continues the medicine both times or stop the medicine any one time? And also inform me what is the level of low BP? Ask your Dr. to stop night dose. Take morning dose early. Measure BP only once every month on fixed date after resting for ten minutes. If BP below 110, morning dose can be reduced after few months. I am 24 years girl. Suddenly my heart beats in creases and feel very fear. As in something is going wrong. Please suggest advice for such sytoms. Dear lybrateuser, -you seem to have anxiety which leads to increase in heartbeat & feeling of fear -to lessen it you should do execise like walking, jogging, cycling, swimming daily for 20-30 min, aiso do yoga & meditation to calm your mind & build your confidence, do for at least 10-15 min, try deep breathing exercise for 5 min -have a nutritious diet as per your daily calorie requirement -sleep peacefully for 7-8 hrs in the night, keep sleeping & awake hours fixed, do not sleep for long in the daytime as it makes difficult to fall asleep during night -be active, follow a hobby, socialize with friends, talk with family & friends to remove your fear.